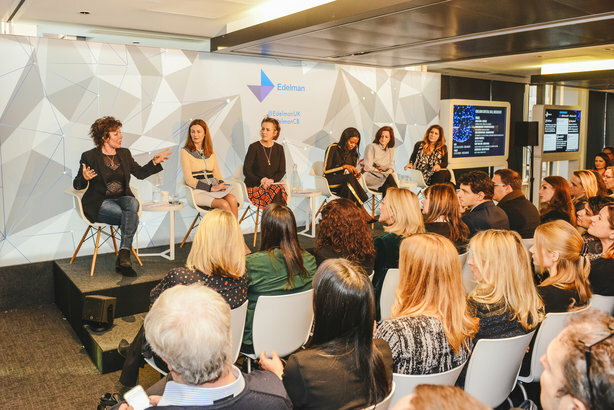 Rising prices and Brexit uncertainty, the political significance of 'Strictly' and the cyber-mafia were among predictions for 2017 made by an all-female panel chaired by Newsnight presenter Kirsty Wark, at Edelman's Crystal Ball yesterday (1 December). Joanna Tatchell, director at Edelman, told a packed room of attendees that the post-truth era meant that in 2017 talk was cheap and would be replaced by action, citing the recent protest by women in Iceland about the gender pay gap as an example. She said: "For a lot of people, this will mean micro-activism. We know we don’t trust what’s happening up there or out there. But what we can do is turn around and do something small... so that we can start judging people not by what they say, but by the actions that they take." Tatchell thought there would be a "gold rush" to understand consumers better in 2017, precipitated by the shock Brexit result. She said: "We don’t understand each other half as well as we thought we did," adding that the antidote was actively listening to each other rather than waiting for the other person to stop speaking. Finally, Tatchell said people were experiencing a growing sense that they did not occupy the centre of their own lives, which was making them anxious and afraid, and that there would be a push for activities which required involvement. We're exiting two decades of being fantastically cool and cynical and disengaged about everything. She added: "We’re exiting two decades of being fantastically cool and cynical and disengaged about everything." Bindi Karia, a start-up expert, spoke of the rise of cyber criminals and likened them to the new mafia. Karia thought 2017 would see more humans employed to catch cyber criminals. She said: "Phishing is very sophisticated and they are getting your data without the knowledge of the company. They steal your corporate data and they hold it to ransom. So you do need a lot more humans involved." Anne Richards, chief executive at M&G Investments, told the audience that 2017 would finally see the return of inflation after Brexit delivered what nearly a decade of printing money since the 2008 financial crisis had failed to do, despite numerous predictions to the contrary. She said: "The depreciation of sterling will feed through into UK price rises, probably on average four to six per cent as we go into 2017, so we’re all going to have to get used to that shrinking chocolate bar effect." Richards said that although ‘Brexit would still mean Brexit’, nobody would know what that means for them in 2017. We’re all going to have to get used to that shrinking chocolate bar effect. She said: "We will be going into 2018 starting to worry that if we don’t get a deal done than maybe easyJet won’t be able to fly direct between various European cities and that there will be lots of other unintended consequences. Will there be a no fly zone, will the French unplug their end of the electricity cable?" Presenter and broadcaster June Sarpong predicted that 2017 would be Ed Balls’ year, thanks to his recent star turn on Strictly Come Dancing. She said: "I think Ed Balls is going to become a very popular and big figure in the UK and Jeremy Corbyn’s days could be numbered." Kirsty Wark quipped: "In politics or in entertainment?" Sarpong also said 2017 would see the return of Tony Blair to fill the vacuum in centre-left politics. "As an entertainer?," Wark quipped. The presenter also thought the post truth of 2016 would morph into something even worse next year. 2017 will be the year of no truth. When someone tells you the truth, you’ll say ‘how dare you tell me the truth’. Wax, who has previously spoken publically about her own battles with mental ill health, told the audience about taking her touring show to mental health institutions. She joked: "They loved it. The bi-polars used to say ‘I laughed, I cried’." Wax said people were living increasingly atomised lives and called for 2017 to be a year of communication, with each other. We’re all alone. We’re in the darkness; once in a while sending out a tweet like a flare from the sinking Titanic. We’ve lost the human connection. Emotionally we have no idea. She said: "We’re all alone. We’re in the darkness; once in a while sending out a tweet like a flare from the sinking Titanic. We’ve lost the human connection. Emotionally, we have no idea."